2 of 4 Meanwhile, in a 12-inch skillet, heat oil over medium-high heat. 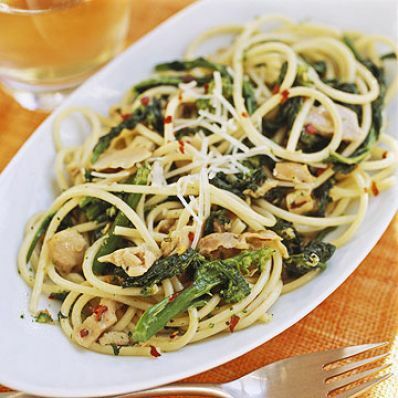 Add garlic and broccoli rabe; saute for 5 minutes. 3 of 4 Stir in clams with their liquid and butter. Reduce heat to medium and cook until butter is melted. Add white wine, red pepper flakes and black pepper. Simmer 2 minutes. 4 of 4 While the sauce simmers, cook spaghetti as package directs. Drain well, then toss spaghetti with sauce and Parmesan cheese. Makes 6 servings.